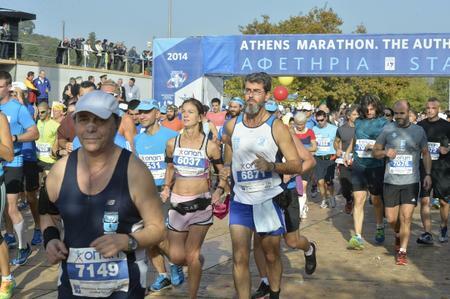 So we arrived in Athens at the peak of summer (last June) and I was already down to run the Athens marathon in November. A big worry for me was how I would manage to do my long runs in the middle of the summer. They couldn’t be done at night, as there is nowhere I can run long distances safely in the evening near my home. So there had to be some daylight…. The first Sunday I was home I think I started my 2 hour run at about 5.40am, painfully early for me. To my huge relief I managed and was done before temperatures reached the 30s. Regarding the rest of my preparation, I kept running 3 times a week, religiously doing Jon’s Tuesday sessions at the track near me as well as repeating the old Thursday ones I have written down in my diary (yes, I write them all down and they have come in handy). I kept my long runs around the 2 hours for a while and ran near the sea front in an area with some decent hills. I even ran (18 miles) during holidays at the beautiful island of Simi and used the hundreds of steps that lead up to the village for some nice stair training. I was truly rewarded by the view. All in all I think I have waken up very early for most Sundays of this summer-not something I really enjoyed and a thing I find quite stressful. But it had to be done! I think the other people running at our track also training for the marathon were a bit skeptical about my going out only 3 times a week (and once a week core and leg training). But I still work and I try to spend as much time as I can with little Niko. 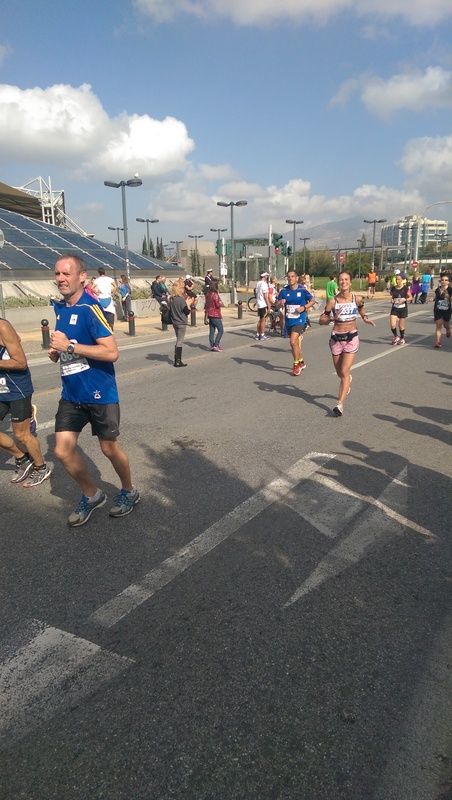 So the time for the marathon approached and I was feeling well, doing some decent times on my long runs (although there always is a disastrously slow one-even my mum told me after coming back from the 22 mile run that that was really slow…..). 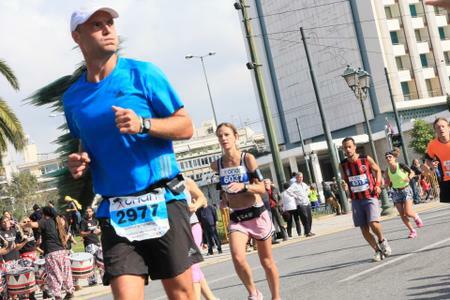 I tapered very well, also taking it easy at the end due to some pain in my Achilles, that fingers crossed was not going to create any problems during the marathon. So the weekend of the marathon came and the excitement hit me and my dad as we went to pick up our numbers from the marathon expo. We bought a lot of gels of all sorts and were planning our fuelling strategy. I think my dad had already planned it, but I was still not on top of it and was trying to figure out whether I needed to drink just water during the race if I took gels, or if it was ok to drink isotonics too. I decided that I was going to start taking them around the half way and from then on take one every 45 minutes. As I had only tried one gel during my training, if things went wrong at least I would be towards the end. My other worry was the temperature on the day of the race. The weather was still awfully hot, around 25oC and very sunny on most days. The weather reports could not however make up their minds about the 9th of November. Many days before they had said that it was going to be any marathon runner’s worst nightmare temperature wise. But some rainy weather the day before made us hopeful. However the clouds gave way to a most clear Sunday sky…. 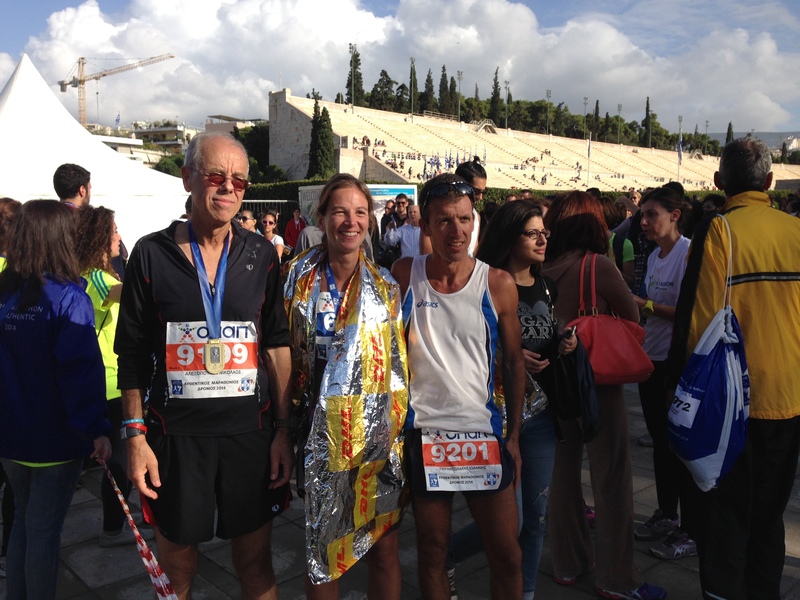 So off we went and got to the familiar by now to us start of the Athens marathon. However, going past the hills that one is going to be facing from about 8 to 18 miles is always quite daunting. So my dad, me and our other friends hugged and wished each other luck and off we all went to our start blocks. As I was about to go to my block I realized that the 4th bottle from my water belt was missing, very upsetting thing to happen at that point as I love my belt and also because this was making the belt unbalanced. I quickly tied an extra top I had with me in the place of the 4th bottle and got to the start (the top became extra when I realized that it was going to be too much for the weather conditions-so yes, I did run in an elite-looking outfit!). My strategy was to go as fast as I could in the bits I could, as I knew the hills were going to slow me down. So I overtook lots of people at the first few kilometers running on the pavement in order to get past. On every station from the beginning I was pouring quite a lot of water on my head and whole body to keep cool. As a result I got to 10k in 53 minutes, pretty decent time for me, even when I only run 10K (unless it’s a race). At around 8m some cruel uphill sections started and I felt that I was working pretty hard. However, I was still taking advantage of any straights and the couple of downhill sections (even though they wrecked my legs even more than the uphills). When they offered us a gel at 12 miles I decided to take it and went to pass the half point at 1.56.54, still ok but not as fast as I would have wished for considering the first 10k. Still ok though and I was quite happy with it. From then on there was the part that I remembered was the worst, from half point and up to about 17-18 miles. David had been waiting for me at the top of those hills the last 2 times I had ran this race. However, this time we decided that it is a very awkward place to get to (since the roads are closed) if one also wants to get to the finish point too. So we had agreed he would come with Niko at 22 miles and then take the metro and make it to the stadium in time for my finish, hopefully. I thought that not having my fun waiting for me at the top of the hills was going to make my task even harder. However, I put my head down and kept going. By now I felt I had dramatically slowed down, had lost my rhythm and thought that all was a bit lost, that I was still going to do the same time as all other times, not a bad thing, but was hoping for some improvement. When we reached a big and what seemed like an endless hill, a guy behind me shouted that this was the last big one. I turned back to look at him, trying to assess whether he looked like he knew what he was talking about, or maybe just to show my gratefulness for the hope his words gave me. I have to say that this was the first time that I hadn’t walked at any point yet. So I did surface at the top of the hill at 18 miles and just then realized that my time was what I had been doing at my training 18 mile runs and that I was still in the game for a good time. And at that point I was running towards my boys. And after 20 miles the downhill bit was starting. So I cracked on, feeling ok and trying to step it. Indeed Niko and David were at the agreed point and I crossed to the left to hug and kiss them. Poor Niko was kissed a lot, he was smiling but also looked a bit surprised. The people around us were shouting words of encouragement and David sent me off and told me to go and not stop any longer. I went and was kind of enjoying myself, dare I say. At some point after the 22 miles, the music of my ipod became tiresome for some reason and I just wanted to hear the sound of the race. I was still doing well and was hitting times that should bring me to around a 4 hour finish time. Well now inside the city I saw my other 2 funs, Maria and Sardella her dog. Maria is a person I admire and respect as she has founded an animal rescue organization in a small town in the heart of the country, something that I cannot imagine had been easy. So I was running this marathon for their shelter. Sardella (the Greek for sardine) is her dog that I met for the first time during this race. She must have thought I was a lunatic, as I saw them before they saw me, started waving, then stopped, kissed the poor dog, then hugged my friend, ecstatic at that point! And off I went! I was taking in the atmosphere of the last 2 kilometers still checking my time and trying to hurry up. 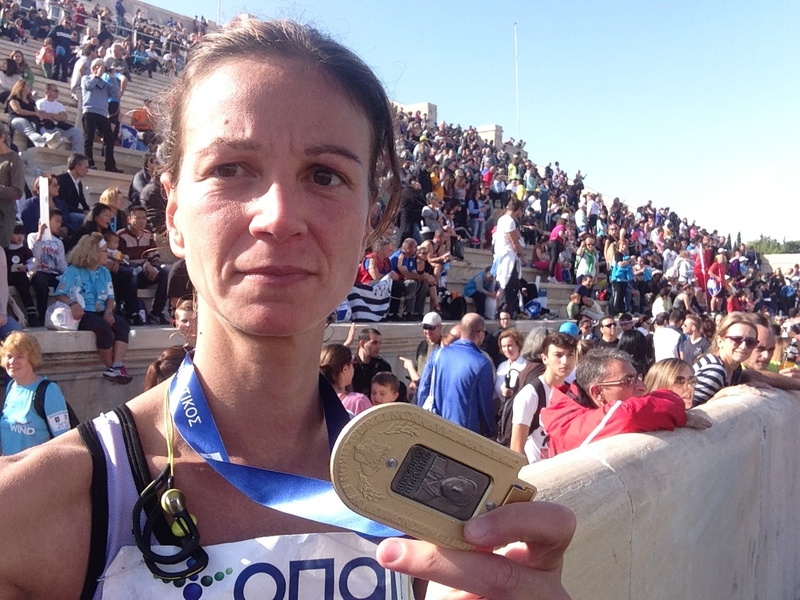 At the last down hill that leads to the Panathenaiko stadium I realized I was going to miss the 4 hour mark. 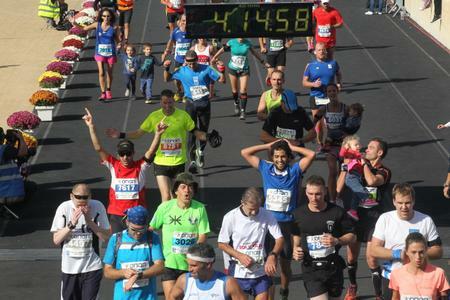 I was running with 4.40m/km pace (5m/km being the equivalent of an 8 minute mile) at the time the clock showed 4.00.00. But I knew I was going to be close, so it really didn’t matter. I entered the stadium and slowed down looking for David and Niko. 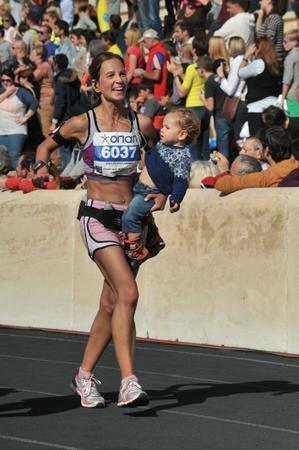 I spotted them, went over and grabbed my half sleeping baby in my arms to run the last 150m inside the stadium and cross the finish line together. I was happy and when we crossed the line I whispered in his ear ‘we won’. Final time 4.02.47, very very happy with it as for me getting close to the 4 hours has been a life long ambition and one that I didn’t think I was going to come close to. My dad also finished pretty well at 4.50 but he was very upset as it was not a PB and he was having cramps in his legs from about 18 miles. Probably due to dehydration, who knows. I still think it’s a great time but I understand his frustration. It was a beautiful race, a memorable day, an achievement for me that I am grateful for. Miss you Clapham runners and hope to see you soon.